To Cite: Mirsane S A, Mirbagher Ajorpaz N, Shafagh S, Aminpour J. The Effect of Video and Images of Operating Room on Patients’ Anxiety Before General Surgery: A Randomized Clinical Trial, Crit Care Nurs J. 2016 ; 9(2):e6543. doi: 10.17795/ccn-6543. Background: Patients experience moderate to high level of anxiety before surgery. Many strategies such as sedative-hypnotic agents are developed to improve anxiety. Objectives: The current study aimed to determine the effect of video and images of operating room on patients’ anxiety, before general surgery. 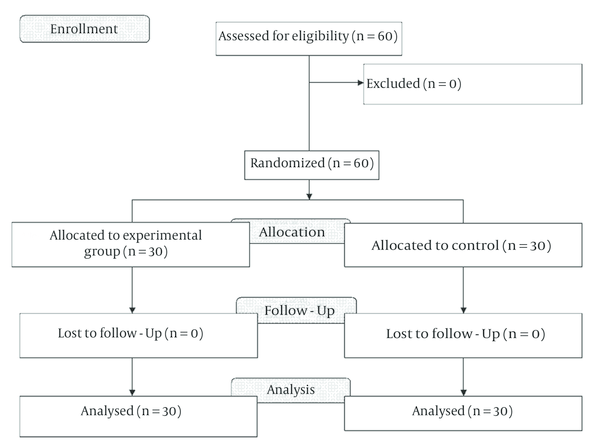 Patients and Methods: A clinical trial was performed on 60 patients undergoing general surgery referred to Shahid Beheshti hospital in Kashan, Iran, from 2014 to 2015. By convenient sampling method, sixty patients were selected and randomly allocated into the experimental and control groups. In the experimental group, the video information and images about operating room was played by a laptop for each patient for 30 minutes on the day before surgery and in the morning before surgery. The state anxiety of the two groups was measured after intervention. The control group received verbal information (the usual method in hospitals). Data analysis was conducted using χ² test, independent T-test and paired T-test by SPSS software version 16. Results: The mean scores of state and trait anxiety before and after intervention are presented in result section. In the experimental group, mean scores of state anxiety decreased from 3.1 ± 43.8 to 2.3 ± 32.4, following the intervention (P = 0.02). However, mean scores did not signiﬁcantly change in the control group (P = 0.3). Conclusion: The current study results indicated that the video and images about operating room can reduce anxiety in patients undergoing general surgery. In the United States of America, some 23 million people undergo surgery each year, experiencing preoperative anxiety and pain (1). When patients undergo surgery, anxiety and depression can affect their physical and mental states; reducing these preoperative complications results in positive effects on the wellbeing of patients and is likely to positively influence the outcomes of surgery (2). Anxiety is characterized by symptoms such as palpitations, sweating, trembling or shaking, shortness of breath or smothering sensations, chest pain or discomfort, and/or stomach distress (3). Lewicka et al. showed that expecting in the surgery ward to go to the operating room increased anxiety (4). Many strategies such as sedative-hypnotic agents are developed to improve anxiety (5). However, these pharmacological agents are usually associated with adverse effects such as bradycardia, hypotension, gut dysmotility, immobility, weakness, and delirium (6, 7). Furthermore, despite protocols provided by clinicians, patients still experience significant levels of anxiety (8, 9). Therefore, the new non-pharmacological treatments are considered. Nurses have an important role to educate patients before surgery. They can reduce patients’ anxiety through education. In different countries, several methods are used to reduce anxiety before surgery including psychological counseling sessions, educational videos, listening to music, showing images and caring before surgery (10, 11). Ayral X et al. found that video information decreased patients’ anxiety before knee surgery (10). Studies show that alternative therapies are increasingly used to reduce patients’ anxiety (12), and the studies suggest that these interventions are very suitable (13). However, Talaei et al., reported that familiarizing the patients with personnel and operating room on the day before surgery had no significant impact on patients’ anxiety (14). A common technique is to use video and image information about surgery and operating room. Evidence showed a reduction in patients’ anxiety before surgery when they were familiarized with the operating room and the personnel (15). However, the ideal tools to provide proper information are still unclear. Verbal information given by the nurses is the most common method (10). A study by Steffenino et al. showed that a pre-intervention informative video improved some important aspects concerning both during the surgery and after that (15). The current study aimed to evaluate the effect of video and images of operating room on patients’ anxiety before general surgery. The current clinical trial was performed on 60 patients under general surgery referred to Shahid Beheshti hospital in Kashan, Iran, from 2014 to 2015. By convenient sampling method, sixty patients were selected and randomly allocated into the experimental and control groups. The study sample size was calculated using the results of a local study conducted by Kanani et al. Based on the results of their study, d and σ were 7.8, and 7 respectively,. Accordingly, with a type I error probability of 0.05 and a power of 0.80, the sample size was determined to include 30 patients for each group (Figure 1) (16, 17). Inclusion criteria were age range 15 to 60 years, complete consciousness, no known anxiety diseases, no history of resolving psychological drugs, patients undergoing general surgery (e.g. appendectomy, colon cancer surgery, cholecystectomy, hemorrhoidectomy, laparoscopic colon resection, laparoscopic and open ventral hernia repair and laparotomy). The exclusion criteria included the patient’s reluctance to remain in the study, decreased consciousness, using tranquilizers or hypnotic-sedative agents during the study. The data collection instrument consisted of two parts. The first part included the demographic and clinical information (age, gender, marital status, educational status) and the second part included the 40-item state-trait anxiety inventory (STAI). This scale assesses two subscales of trait anxiety and state anxiety each of which with 20 themes. Each theme is scored based on a 4-point Likert scale (one almost never to four almost always). The total score for each subscale of STAI is from 20 to 80. Higher scores represent higher anxiety in the individuals (18, 19). In the current study, a Persian version of STAI was utilized. Validation of the Persian version yielded satisfactory results. Rabiee et al. and Roohy et al. calculated the Cronbach’s alpha coefficient of 0.89 and 0.90 for the Persian version of STAI, respectively (20, 21). After explaining the research objectives, written informed consent was obtained from the participants. There are perceived relationships between gender and marital status with levels of anxiety (22, 23). Therefore, before allocating the subjects to the two groups, they were matched according to gender and marital status. After allocating the patients into the experimental and control groups, the researcher extracted the patients’ demographic and clinical data and transferred them into the first part of the instrument. Participants were moved to a quiet room. The room conditions were the same for the groups in terms of humidity (30% - 45%), temperature (23°C - 26°C) and light (dim light was used). In the experimental group the video information and images about operating room were played by a laptop for each patient for 30 minutes on the day before surgery and in the morning before surgery. The video information provided details about the surgery procedure, recommended behaviors to be followed before surgery, operating room circumstances and information about before and after the surgery. Images included surgical tools and instruments, surgery bed and cialite. Finally, the researcher answered their questions. The state anxiety of the two groups was measured after finishing watching the video and images. The experimental group received information about video education and the control group received verbal information (hospitals’ routine procedure). The content validity of the video and the images was confirmed by two faculty members of School of Nursing and Midwifery in Kashan University of Medical Sciences. The first author of the study conducted all the sessions and collected data. The state anxiety in the two groups was measured before and after intervention. The results were finally analyzed by SPSS software version 16 using Chi-square and T-tests with a significance level of 0.05. In the experimental and control groups, 60% and 70% of the patients were married, respectively. In the experimental and control groups, 63.3%and 60% of the patients were female, respectively. As for the level of education, 50% and 33.3% of the patients in the experimental and control groups held high school diploma (Table 1). Mean scores of state and trait anxiety before and after the intervention are presented in Table 2. In the experimental group, mean scores of state anxiety decreased from 3.1 ± 43.8to 2.3 ± 32.4 following the intervention (P = 0.02). However, mean scores did not signiﬁcantly change in the control group (P = 0.3) (Table 2). aValues are express as mean ± SD. The current study investigated the effect of video and images of operating room on patients’ anxiety before general surgery. Several studies showed that patients have anxiety before and during invasive procedures such as surgery (24, 25). Studies showed that lack of knowledge about treatment and unfamiliarity with the environment are the main reasons for anxiety (26, 27). In the current study, a significant difference was observed between the mean scores of anxiety before and after showing video and images in the experimental group. These findings are consistent with those of a study by Philippe et al. (26). Other studies showed that every kind of training can reduce anxiety in patients undergoing general surgery (28). Yeganeh-Khah et al., concluded that patients face to face training and using pamphlets or CDs could reduce the level of anxiety in them (29). But the current study showed that familiarity with the operating room by showing video and images can reduce anxiety in patients undergoing general surgery. These findings were consistent with those of Mladenovski and Kieser who showed training by multimedia can decrease patients’ anxiety (30). The reason of these differences is owing to the educating method, time and educational content. Since the Spielberger inventory used in the current study is a self-report instrument, the results might be biased. Moreover, the study was conducted on the candidates for general surgery; thus, a similar study is recommended to be performed on patients undergoing other invasive procedures. Additionally, the current study was conducted in a single center with a limited number of samples and patients’ anxiety was the only parameter under investigation. Therefore, it is highly recommended to conduct further studies with larger sample sizes to assess more outcomes such as vital signs, hemodynamic parameters and stress hormones. The results of the current study indicated that the video and images about operating room can reduce anxiety in patients undergoing general surgery. Authors are grateful to the research deputy of Kashan University of Medical Sciences for financial support. Authors would like to thank all patients who participated in the study. Authors’ Contribution Neda Mirbagher Ajorpaz, developing original idea, study concept and design and study supervision; Shima Shafagh, study concept and design, critical revision of the manuscript for important intellectual content; Sayed Alireza Mirsane, Davood Kheirkhah and Javad Aminpour, study concept and design, acquisition and analysis of data, interpretation of data and writing the manuscript. Conflict of Interests None declared. Funding/Support The current research project was fully funded by Grant No. 94077 from Kashan University of Medical Sciences, Kashan, IR Iran.